Business Loop I-80 through Evanston overlays former U.S. 30S and Business U.S. 189 through the city along Harrison Drive, First Street and Bear River Drive. Passing under Interstate 80, the next left is the onramp to the freeway westbound to Ogden and Salt Lake City. Ahead, Business Loop 80 and Business U.S. 189 proceed along Harrison Drive toward a commercial area that features multiple hotels, restaurants, and gas stations. 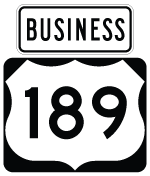 Generally, Business 80 follows the old alignment of U.S. 30S and U.S. 189 through the city of Evanston. Photo taken 08/05/13. Eastbound Business Loop 80 and Business U.S. 189 (Harrison Drive) connect with the onramp to Interstate 80 west and U.S. 189 south. Interstate 80 proceeds west to Salt Lake City, U.S. 189 proceeds southwest to Provo, and Interstate 84 begins about 30 miles west of here to travel northwest toward Ogden. Photo taken 08/05/13. The next intersection connects Harrison Drive with Wasatch Road. This is the old alignment of U.S. 30S and U.S. 189 that provided the main route west out of Evanston before Interstate 80 was built. Wasatch Road follows the north edge of Interstate 80 from here west into Utah, reconnecting with the freeway at Exit 191. Most of the road west of the state line is unpaved and not suitable for through traffic. Harrison Drive (Business 80 and Business U.S. 189) will turn from north to east after this intersection. Photo taken 08/05/13. The city of Evanston incorporated initially in 1868 (to coincide with the arrival of the Union Pacific Railroad) and again in 1888. Photo taken 08/05/13. Harrison Drive curves east and encounters a series of gas stations, hotels, and restaurants. This is a fairly typical arrangement on the outskirts of a Wyoming city along an off-Interstate business loop. Photo taken 08/05/13. Leaving Bear River State Park and the State of Wyoming Information Center, Bear River Drive becomes Business Loop I-80 and Business U.S. 189. The two signed routes intersect with Interstate 80 and U.S. 189 at this diamond interchange (Exit 6). Turn right for Interstate 80 east to Lyman, Green River, and Rock Springs and U.S. 189 north to Kemmerer, Big Piney, and Jackson. Turn left for Interstate 80 west to Salt Lake City and U.S. 189 south to Provo. Photo taken 08/01/16. Reaching the end of the loop in Evanston, westbound Business 80 and Business U.S. 189 (Harrison Drive) approach their junction with Interstate 80 and U.S. 189. Interstate 80 travels west to Salt Lake City (with a connection to Ogden via Interstate 84 west and Provo via U.S. 189 south). Photo taken 08/05/13. A Sinclair dinosaur stands guard at the entrance to a Sinclair gas station next to Harrison Drive in Evanston, not far from the Interstate 80 interchange. Photo taken 08/05/13. The next intersection along westbound Business 80 and Business U.S. 189 (Harrison Drive) is with Wasatch Road, which follows Old U.S. 30S west toward the Wyoming-Utah state line. While the road is paved in Wyoming, it becomes unpaved once in Utah. Photo taken 08/05/13. As a late-day thunderstorm brewed overhead, the right lane of Harrison Drive links to Interstate 80 west and U.S. 189 south to Salt Lake City, Ogden, and Provo. The left lanes continue under the freeway to link to Interstate 80 east and U.S. 189 north to Rock Springs and Cheyenne. Photo taken 08/05/13. Harrison Drive connects with Interstate 80 east and U.S. 189 north at this ramp. Ahead, Overthrust Road proceeds south toward the Rocky Mountain Health Center (hospital). Photo taken 08/05/13. This view looks south from Interstate 80 toward Overthrust Road and the west end of the Evanston business route. Photo taken 08/01/16.